Climat? Terroir? Evocative of place? 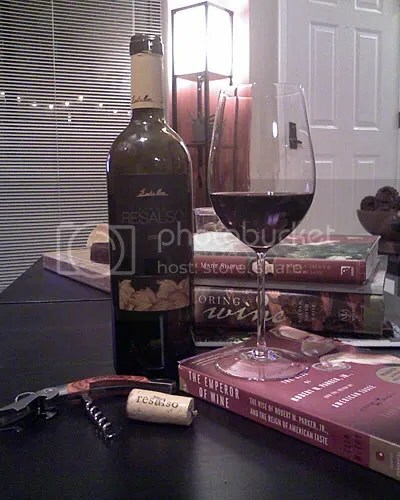 Which ever term or buzz word suits your sensibilities best, it certainly fits this wine without a doubt! I had a fairly nerve-racking day leading up to the cracking open of this bottle; it was Monday and I was called into the office of the Sr. VP to discuss my place in the company and where I might fit in, in the future. So, I got home, unsure of my security and needed to find some inner peace; return to a place where I was happy relaxed and in love. 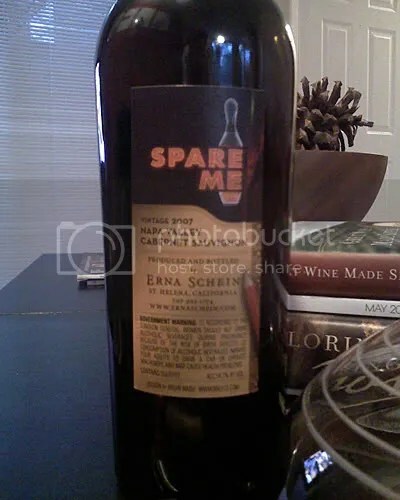 So I opened up my bottle of the 2007, Erna Schein, “Spare Me” Cabernet! I let it decant for about and a half before I sat down with the first glass. I swirled. I sniffed. Instantly I was transported back to that very happy place a top the mountains, sitting in the vintage Westcraft trailer. I could smell the rain and mist, the trees the rain-soaked gravel, the stone walls. I was content. 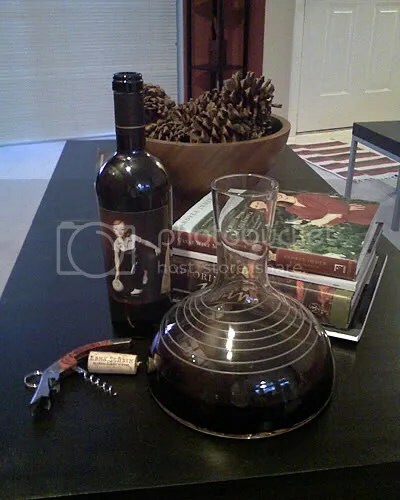 Though I feel it was a tad young and could have sat for another several years it was still drinking quite well with lush aromas of dark berries (plum and black cherries), cherry cola (or was it Dr. Pepper? ), fresh cracked black pepper, mineral (wet river rocks) and toasty oak notes mingling together in a beautiful bouquet that seemed to last forever and set up the senses for an equally complex and structured palate swirling with black cherry and plum flavours accented with hints of anise, dark chocolate and swirls of cherry compote filling. The tannins were softening up but still integrated enough to avoid being astringent and helped kick off the long finish the added just a hint of cherry tart acidity. I suppose that I felt a slight twinge of regret opening her up so soon after she arrived but wine, after all, is meant to be consumed and enjoyed, which she was! And, now that I’ll be making a bit more money, I’ll be able to buy some more! What can get any better than good food and good wine? Okay, great food and great wine! But even they are subject, like many sensory things, to time and place and those we surround ourselves with. When we have these elements just right even the most pedestrian things can seem extraordinary and merely good things can become great things. So, there I am, sitting crossed legged on my living room floor at the coffee table with the love of my life sitting right there beside me. 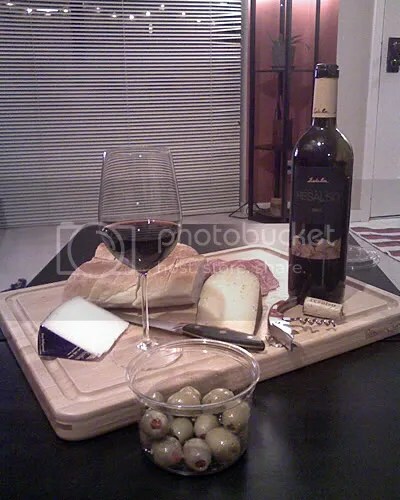 In front of us a feast of our favourite cheeses, salami, Roasted Red Pepper stuffed Olives, fresh bread and, of course, vino! Are all of these the best there is? That’s a matter of opinion, but given the time, place and company, they were the best that night! The grapes were sourced from vines ranging in age from 5 to 15 years old and the wine was aged for 4 months in new French oak. It has a lively deep ruby colour that glints like a liquid gem. The nose is ripe with red berry aromas and underlying notes of dusty minerality and spice that are very evocative of the place where this wine came from. I could almost smell the dry sun-baked soil and smell the vines on the warm breeze. On the palate this wine didn’t disappoint and was almost Bordolaise with powdery minerality and dry earth notes taking the lead with rich dark fruits bringing up the rear to deliver a luscious mouthfeel supported by well-integrated, soft, almost silky yet chewy tannins. And the finish was long and warm with just enough hint of acidity to keep the fruit flavours alive. It’s character really played well with the soft and creamy nature of the Drunken Goat cheese and had wonderful contrast to the shaper Oro Secco and Olives. The tannins were perfect match for the fatty goodness of the salami as well and if I closed my eyes I felt like I could have been sitting somewhere in Spain! So, was the meal great in its own right? I say yes. Was it because of time and place and company, again I say yes. Does it matter which one? Not in the slightest. Drank this first one Saturday night. It was a sample bottle and really nothing too exciting or cerebral to write home about. We had some neighbors over last night for some homemade empanadas and flan so the GF picked up a bottle of my favourite Malbec, which I preceded to decant about two hours before our guests arrived and what a beaut she turned out to be! She really just opened up with a lush fruity nose of raspberry and chocolate notes and hints of smokey spice. 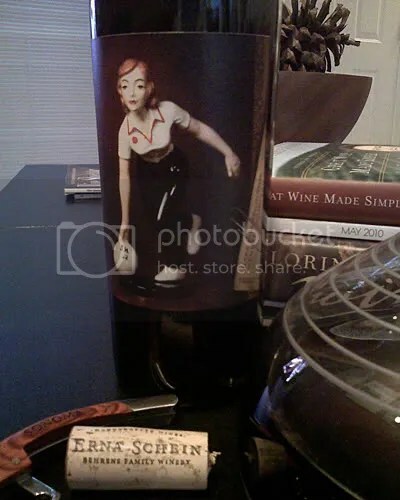 The palate was rich and full-bodied with deep cherry and blackberry flavours perfectly balanced by fine tuned and soft sweet tannins, which kicked off a long, nay eternal, finish that was borderline orgasmic! It paired beautifully with the traditional empanadas…it was as close to heaven as I’ve been in a while. Our friends brought a bottle of the 2006 Luigi Bosca Pinot Noir, which was a single vineyard PN from Maipu Valley. 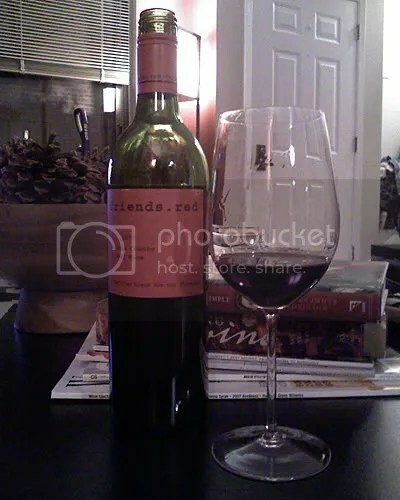 It too was rather nice with bright cherry and strawberry notes with just enough earthy and leathery spice to keep it from becoming to juicy but after the malbec it was like the opening act following the headliner and so it lost out a bit in the love department. But I liked it! 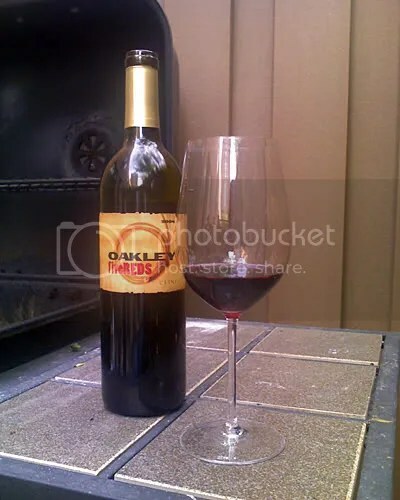 So, as I didn’t have to work the Grapes last night I took the opportunity to get home early and spend the beautiful evening with my GF on the patio and grill some steaks and drink some vino! It’s a pretty lush wine for the price. Not too cerebral but stupid by any means either…perfect for casual sipping on a gorgeous Spring evening. It’s a blend of Merlot, Zinfandel, Barbera, Alicante Bouchet, and Petit Verdot. It has a fruity and peppery nose that’s quite aromatic. It’s full-bodied with lovely dark fruits and silky smooth tannins. It doesn’t go too deep in complexity but that’s part of its charm. It goes just far enough that it doesn’t get to fruit bomby. It’s tannic structure was soft but enough to work perfectly with the grilled steaks. If I get enough funds I’d certainly purchase a case of this! Even the pup likes a little vino from time to time! Okay so I almost forgot the final installment of my Napa experience. This was late in the day on Saturday after we tooled around Sonoma Square, Train Town (don’t judge), Cline Cellars and Viansa (a nostalgic visit for some good cheese and Balsamic/zin vinegar. Anyway, as we pulled out of Viansa at around 5pm we called up to Mustards to see about availability, because last-minute is how we roll! It was no surprise that they were fully booked for that night but they said it was still early enough that they were still seating walk-ins on a first come first serve basis at the bar. The earlier we could get there the better! Now I’m sure a few of you know just how far away we were but I managed to roll up at Mustards at just about 5:30pm. We walking in and the hostess knew exactly who we were and praised us on getting there so quickly…I explained that eating here was THE ONLY thing that my girlfriend wanted to do and with that the hostess proceeded to seat us at a nice table in the main room! Now I have been going on and on about stupid lent and here we are just a day away from the end of lent, at Mustards…sorry but we had to cheat…I promised I’d eat fish on Easter, which I did. And I had the Truck Stop (21 day aged ribeye)! Pure heaven on a plate! 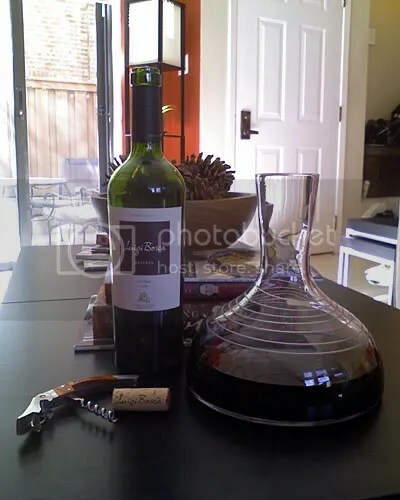 And we paired it with a nice half bottle of the 2007 Hess Allomi Vineyard Cab! Sure they had much nicer but at this stage this was the only cab in budget range and it was really nice to say the least. It was the perfect meal to cap off an otherwise perfect weekend in Napa and Sonoma and really was a major highlight of the entire trip. As we headed back down 29 with the sun easing into the west we caught a glimpse of the Napa Train heading north…. Last but not least on the Napa wine tour itinerary: Behrens & Hitchcock / Erna Schein winery in St. Helena! Well, not in the town proper that’s for sure. It’s a left turn off 29 onto Spring Mountain road and continue until you’re afraid your rental Hyundai will no longer make it, then turn right and continue down, “are-you-sure-this-is-a-road” lane until you get to a very large topiary with a huge barrel at its base. Pull into gravel lot and park near vintage 1947 Westcraft trailer. Engage all forms of parking and emergency brakes and wait for Sir Edmund Hillary! Or in this case Robin! The rain was nearly lateral at this altitude but you really didn’t care. The views breath-taking and the air refreshing. The rustic nature of the landscape was preserved with the rustic nature of the tasting room/trailer. There was nothing pretentious about any of it and when it came down to it the whole experience was about the land and the wine. Inside it was cozy and warm, even as the wind rustled the trailer and the rain pattered on the roof and windows. Robin told stories and talked to us like we were old friends over for a glass or two of vino. The wines were amazing and it was really hard to choose a single favourite and if I had the funds I would have bought at least a bottle of each, but we went with the 2007 Spare Me cab for its Lush and approachable style of dark plum and blackberry flavours balanced by silky smooth yet chewy tannins and the rich and almost creamy chocolate spice notes on the finish. By the time we were finished tasting and talking the rain began to let up a bit and we were treated to a rainbow and a glimpse of the valley floor below. A parting shot of the trailer and a couple of barrels hanging out back! It was a great day in Napa and though I was sort of sad that this portion of the day was over I was looking forward to getting back down to the hotel in Napa with my family and relaxing. By the time we reached the River Terrace Inn the sun was out, the rain had passed, and the temps rose just enough that my girlfriend’s daughter got to jump in the pool for a bit. Back in the room we ordered pizza in, watched some Ghost Adventurers, and fell asleep. Tomorrow was a whole new day! This is the other wine that I was asked to try and evaluate. 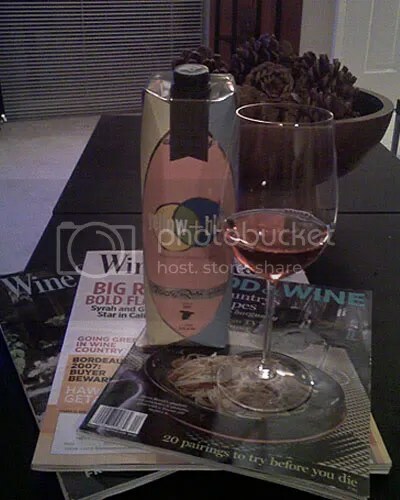 Have to admit I was a bit weary of the carton but being a wine lover and as it was “on the house” I couldn’t say no. So, when I got home last night after a very long day I popped this sucker in the freezer for a quick chill, which this rose certainly with benefit from…too warm and there’s an astringent quality to the finish. This one is made from 100% organically grown Syrah and Monastrell and comes in this handy little 1 litre carton. However, pour this little gem into the glass and you’re treated to a wonderful rosy gem colour and a crisp nose of chilled strawberries and pink grapefruit with just a hint of powdered white pepper and rose petals. The palate is quite round, almost medium-bodied, smoothly textured, and the mouthfeel is coating not cleansing. Red fruits mix with tart citrus notes and a nice bright acidity (which is bitter and astringent if too warm). The finish is rather lingering with some peppery notes and subtle tannins. This one really likes food such as medium sharp cheeses and fresh chilled strawberries. Overall this is a great, inexpensive Spring and Summer chiller.